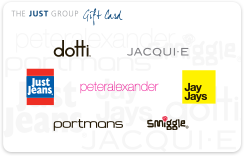 The Just Group sell Just Group gift cards to corporate clients in Australia and New Zealand. Just Group gift cards are redeemable in Just Jeans, Jay Jays, Portmans, Jacqui E, Dotti, Peter Alexander and Smiggle stores. For all Just Group corporate card enquires please contact us in Australia on 1800 229 688 and New Zealand on 00 61 3 9420 0498. Neither The Just Group, nor the provider of the data, represents or guarantees, or accepts any liability whatsoever in respect of, the accuracy, currency or completeness of the gift card information. The Just Group does not accept any liability for any delays, interruptions, errors, or omissions, however occurring (including as a result of negligence) in the collecting, recording, processing, storing or dissemination of this information. Just Group corporate gift cards cannot be purchased in store. Just Group gift cards can be purchased by corporate customers by contacting us in Australia on on 1800 229 688 and New Zealand on 00 61 3 9420 0498. You can purchase any item in store using your gift card. Give the gift card to the sales assistant when making your purchase, you will need to scratch the panel covering the access code and enter this number on the pin pad when prompted. Once the transaction has been completed your gift card balance will be reduced by the purchase amount. You can use your gift card as many times as you want until the balance reaches zero. We will not refund cash for any unused gift card amount. You can either check the balance of your card online or in-store. Every time you make a purchase in-store the receipt will show you the previous balance, transaction value and remaining balance. You can check your transaction history online or by contacting us on 1800 229 688 . Gift cards are valid for 12 months from the issue date, or if issued in NSW or online to a delivery / billing address in NSW from 31 March 2018 or SA from 10 December 2018, 36 months from the issue date. Once the gift card has been fully redeemed, it cannot be reused. The gift card issuer is Just Jeans Group Pty Ltd ("Just Group") ABN 49 004 947 460. A defaced, mutilated, altered, lost or stolen card will not be replaced, refunded or redeemed. Once activated the card is: redeemable for merchandise at the following stores in Australia: Just Jeans, Jay Jays, Jacqui E, Dotti, Portmans, Peter Alexander and Smiggle (and their corresponding Australian online stores); not redeemable for cash and is not a negotiable instrument; valid for 12 months from the issue date, or if issued in NSW or online to a delivery / billing address in NSW from 31 March 2018 or issued in SA or online to a delivery/billing address in SA from 10 December 2018, 36 months from the issue date or until no amount remains on the card; not able to be reloaded; partially redeemable. Cash will not be given for any unused amount. Any unused amount after the card expires will not be refunded or credited. This gift card ("card") is issued by Kimbyr Investments Limited, Company Number 205268 ("Company"). A defaced, mutilated, altered, lost or stolen card will not be replaced, refunded or redeemed. This card once activated is: redeemable for merchandise at the following stores in New Zealand: Just Jeans, Jay Jays, Jacqui E, Dotti, Portmans, Peter Alexander and Smiggle; not able to be redeemed at Just Jeans online, Smiggle online or Peter Alexander online; not redeemable for cash and is not a negotiable instrument; valid until the earlier of the expiry date shown on the card (being one year from the date of issue) or when no amount remains on the card; not able to be reloaded; partially redeemable. Cash will not be given for any unused amount. Any unused amount after the expiry date of this card will not be refunded or credited. Between 9am - 5pm weekdays Australian Eastern Standard Time.